You may have noticed that it’s been a ghost town on my blog and social media these days. I don’t like to make big announcements when I go away, so I snuck away quietly to visit family in Ohio. My eldest niece graduated from High School. To celebrate, we had a nice party for her at my parents’ house complete with a pink port-a-potty. Sadly, I did not get a picture which is too bad because my daughter was obsessed with that thing. For me, the highlight was having so much of my family together again. Since my grandma died, we don’t all get together for things like we used to before she died. I miss it. It’s important for my kids to know their family. 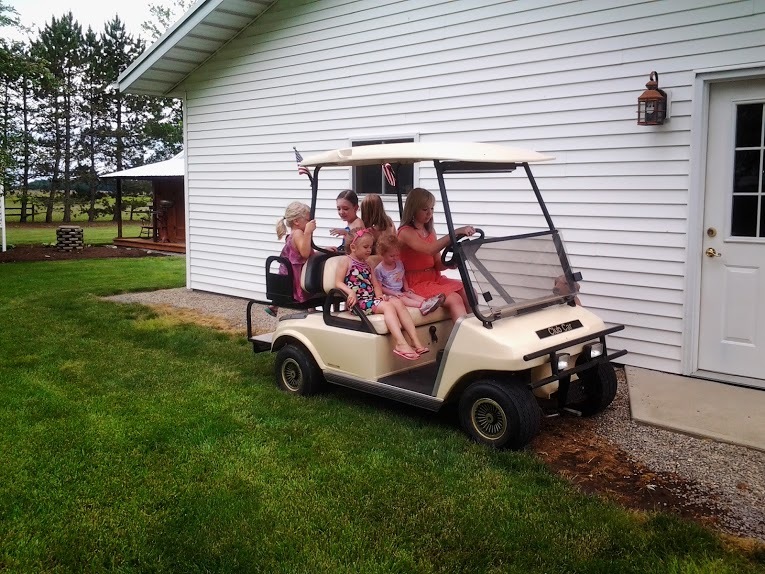 The best part of any event at home is always riding in the golf cart! The rest of the trip was spent doing various field trips which I will be writing about in the next week or so and spending time with nieces, nephews, cousins, family, and friends. We ended our trip by stopping at my mother-in-law’s on the way home to surprise my husband’s grandma for her birthday with everyone coming together for dinner. Needless to say, we are all exhausted today and taking the day off! I have a lot of great posts planned for the next week and will be starting up the weekly memes next week as well. I hope you all are having a great week and enjoying the summer weather!